Frannie, a second grade student at St. Madeleine Sophie School was recently the youngest athlete to compete in the Special Olympics Games in Seattle. This is not just a story about Frannie. This is a story about St. Madeleine Sophie School (SMS) and the commitment of the school to empower each child of God to serve, lead, love and learn. Frannie was supported and encouraged every step of her journey by her community at SMS. She was empowered to be in the spotlight during the games in part because of her experience at SMS. 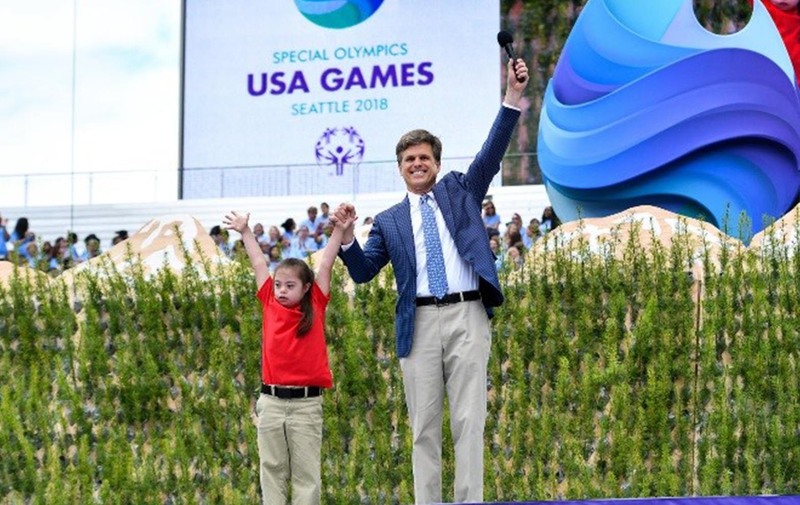 Team Frannie started at St. Madeleine Sophie School, but her fans soon spread to the likes of Archbishop Sartain and even Tim Shriver, Chairman of Special Olympics International. Frannie shared a message of love during the games, but the message of love and hope – and inclusion – was instilled at St. Madeleine Sophie. Thank you! The 2018 USA Games said, "Rise with Us" and you did - with open hearts and minds. You were magnificent hosts… So many moments moved me while I was in Seattle, too many to list here, but I was especially moved by my guest on stage for the Opening Ceremony, Frannie Ronan, who said to all in the stadium, “I love you.” Frannie is yet another leader in the Inclusion Revolution that is spreading a message of love and acceptance to all.